Social media is great for getting in direct contact with your customers. We are here to clear the mist surrounding social media, click the button below to get started or continue reading to find out why a social media campaign is vital for your business. Most business do not have the time or resources to keep on top of a Social Media campaign, but the statistics below show why you should be incorporating Social Media as part of your marketing plan. Facebook – At the end of last year, there were more than 42 million pages on Facebook (statistics taken from the official Facebook site). Twitter – In January alone, 39,523,152 unique users visited twitter.com (statistics taken from compete.com). Linkedin – Linkedin has 150 million+ members and is still growing. Great For SEO – Search Engine Optimisation (SEO) is a way of driving customers to your website. A strong social media campaign helps to bolster your SEO efforts by making your websites’ content easier to reach from across the whole of the internet. Brand Awareness – The majority of the population are now visiting Social Media sites on a regular basis to search for companies, businesses, products or services, so establishing your name on these sites is a good way of increasing brand awareness and informing people who you are and what you do. Advertise Products & Promotions – A way to increase the number of followers and fans that you have is through promotions, offers and competitions. Engaging With Your Audience – It’s hard to engage with your audience through your website, but Social Media sites are perfect for this. 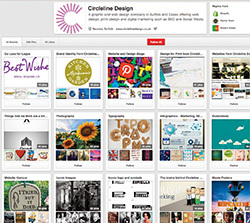 Start conversations with your followers and find out more about your fans. Remember that your customers like to see the face behind the business. If like most businesses you don’t have the time or resources to implement a Social Media campaign, then we have a solution for you. If your aim is to increase and build an online presence using Social Media, click one of the get started buttons. We can take care of all your Social Media accounts for you; Facebook, Linkedin, Twitter, Pinterest, Google plus and more. 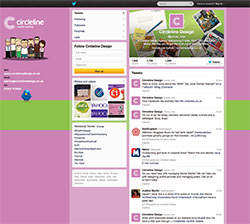 Already we have seen how Social Media has worked for Circleline and the many benefits it has to offer. We understand that it can be unclear what social media actually involves, this is why we have put together a simple and concise table of exactly what you can expect with one of our social media plans. Contact us if your preferred social network is not listed above. All prices shown include VAT. * We will create the profiles for the social networks you choose for us to manage. Essential features include, keeping on top of messages, conversing with your customer base and driving referal traffic to your website. For WordPress integration we need to have access to your site and it must be running WordPress, if you would like to convert your site to WordPress then please contact us. 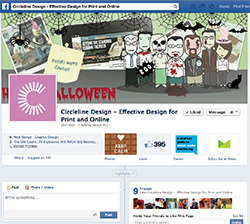 Facebook and Twitter design includes one hour of design for your profile pages.